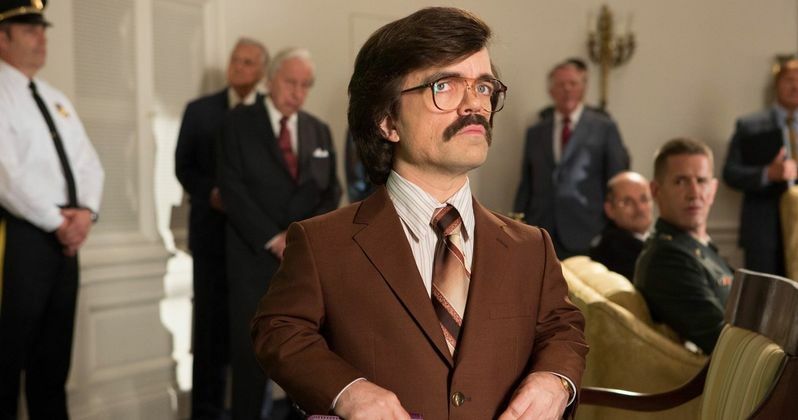 Although Mystique (Jennifer Lawrence) can disguise herself as anyone on the planet, she cannot hide from Bolivar Trask (Peter Dinklage) and his Sentinel program in a new clip from X-Men: Days of Future Past. As Bolivar tries to explain, the Sentinel program will not even activate if there are no mutants in the vicinity, which is how he spots Mystique before she takes out everyone in the room. However, as Wolverine (Hugh Jackman) explains in the first of two new TV spots, the Sentinels were first designed to target mutants, before they began taking aim at humans as well. Check out the latest footage from director Bryan Singer's highly-anticipated superhero sequel, arriving in theaters May 23, then read on for new information about the X-Men Alternate Timeline website. X-Men: Days of Future Past brings together this summer's biggest superhero cast! 20th Century Fox invites you to explore this new immersive experience through the X-Men Alternate Timeline X-Tension. Transform your Facebook into an interwoven history of the X-Men and their battle for mutant rights here: X-MenMovies.com/X-Tension. This Alternate Timeline website only works in the Google Chrome desktop browsers, not for mobile browsers.